A. de Ruiter, C. Damaren, J. Forbes, Spacecraft Dynamics and Control – An Introduction, John Wiley and Sons Ltd, January 2013. Additional material such as exercises, supplementary material and errata may be found here. This textbook presents a rigorous, yet practical and accessible introduction to the fundamentals of spacecraft dynamics and control. Written for engineering students and practicing engineers with a basic background in mathematics and mechanics, it is suitable for both upper-year undergraduate courses and first graduate courses, as well as self study. The material covered is comprehensive; all the pertinent aspects of a spacecraft mission including orbital dynamics, attitude dynamics, and control are discussed. Additionally, advanced topics such as low-thrust trajectory analysis, nonlinear spacecraft attitude control, and navigation techniques are introduced. 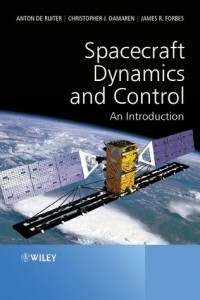 A unique feature of this textbook is the presentation of classical control systems design techniques using spacecraft attitude control as the motivating control design objective. “I consider this book an excellent pedagogical exposition of spacecraft dynamics and control…I have no doubt that this book will earn its place amongst the other excellent treatments of the subject mentioned above.” – Dr. Marco Quadrelli, IEEE Control Systems Magazine, April 2015, pp. 103-105.